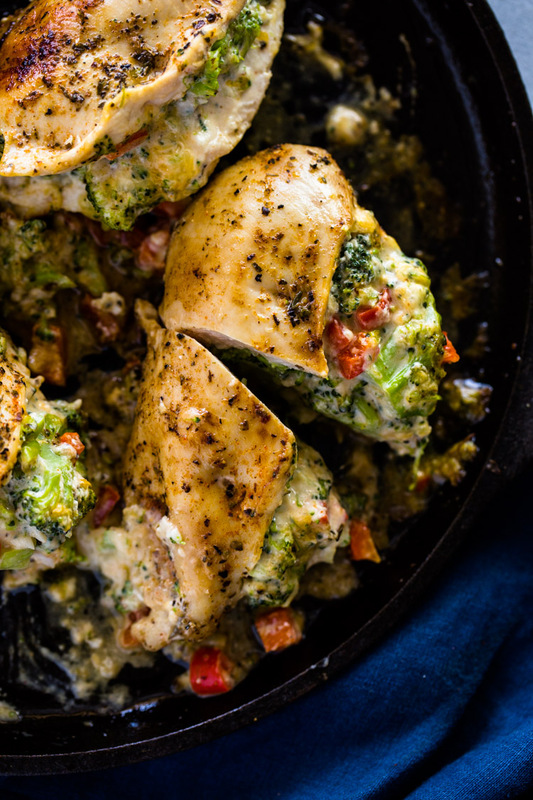 Tender Chicken breasts stuffed with broccoli, parmesan, cheddar, and cream cheese. 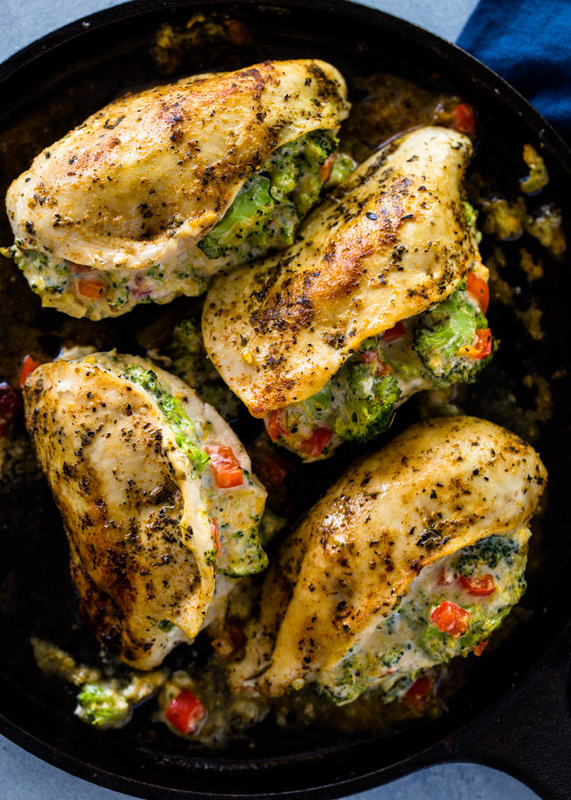 This quick flavor-packed meal is bursting with flavor and texture and makes a delicious low-carb dinner. I’ve become a tad obsessed with chicken breasts lately. The whole concept is of stuffing chicken breasts with your favorite flavors and having a complete dinner is just too good to pass up. All the flavors cook inside the chicken breasts and make the chicken super juicy and flavor-packed! 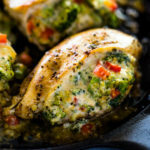 A few weeks ago I shared my garlic spinach parmesan stuffed chicken breasts and this week I’m sharing this DELICIOUS broccoli and cheese stuffed chicken. The filling is a mixture of steamed broccoli, garlic, bell pepper, parmesan, cheddar, and cream cheese. 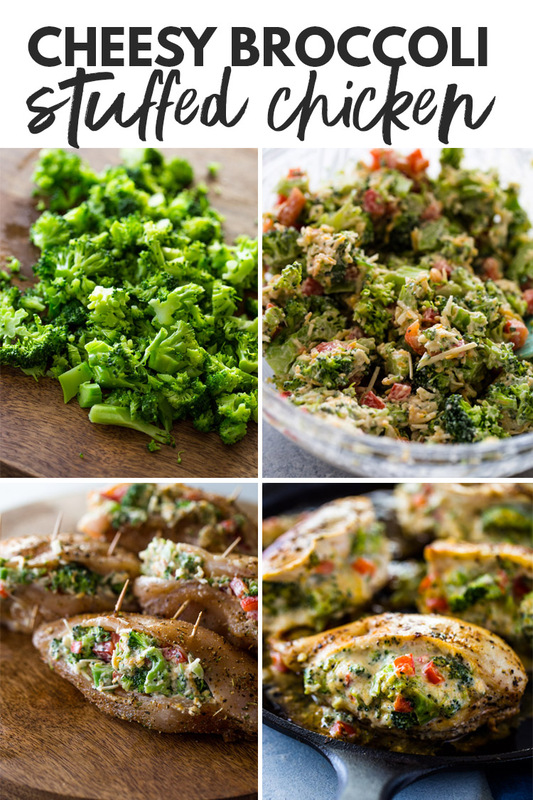 The parmesan and cheddar make the broccoli and chicken super juicy and gooey and the creamy cheese ties the whole dish together and gives it a creamy texture that is AMAZING when combined with the cheddar and parmesan! To begin, steam broccoli florets in the microwave or on the stove-top. Alternatively, you can also blanch them for 1 minute in boiling water. After they are cooked, run them under cold water, drain, and roughly chop them into chunks. 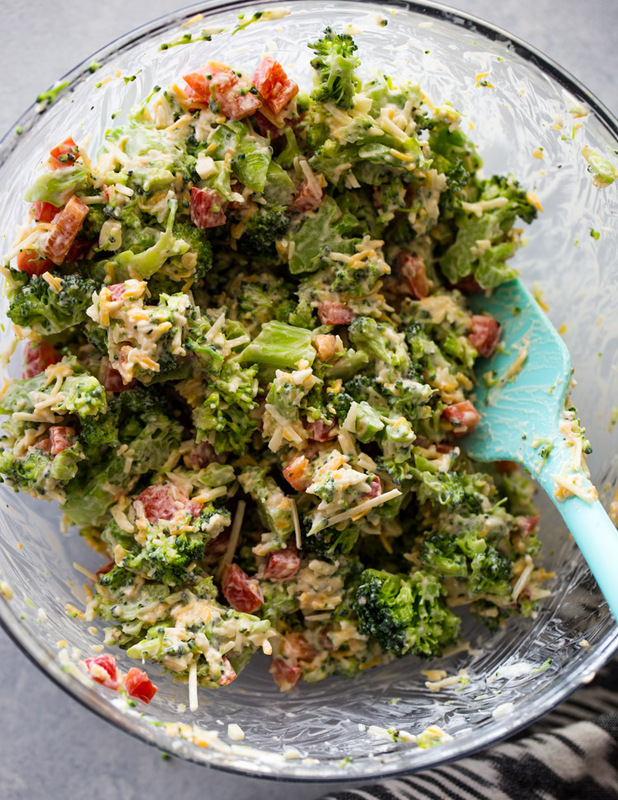 To the broccoli add bell pepper, garlic, and your favorite cheeses. I like to use parmesan, a melting cheese, and cream cheese. If you don’t have cream cheese, you can replace it with mayo. Mix everything up and stuff into butterflied chicken breasts. If this is your first time stuffing chicken breasts then fear not. The whole process is not as complicated as it looks. Butterflying chicken breasts for stuffing is all about making a secure “pocket” for the stuffing rather than butterflying the chicken all the way through. 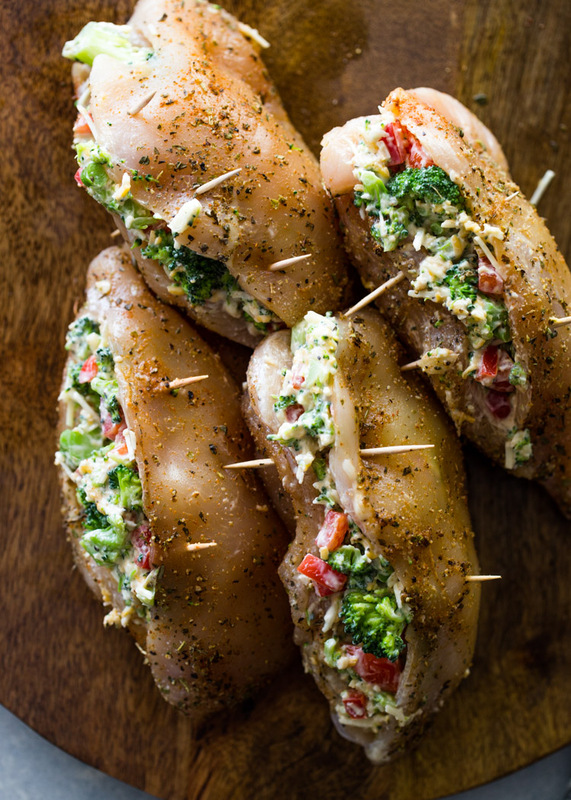 Use a sharp knife to slice each chicken breasts horizontally to form a pocket – be sure not stop cutting about 1/2 inch from the sides and back of the chicken breasts so you aren’t cutting all the way through. Please refer to the video below to see how to complete the step! To steam broccoli: Chop the broccoli florets into small pieces. Put all the broccoli in a microwave-safe bowl and about 2 tablespoons water. add water. Cover with plastic wrap and microwave on high for 2-3 minutes. Alternatively, steam on stove-top or blanch in boiling water for 1 minute. Could I brown them in the fry pan and then finish them off in a slow cooker? Was this recipe written by a Chinese bot? the syntax and grammatical errors are embarrassing! But for the record, the recipe is great. This looks delicious! I Am going to make it tonight, but i forgot cheese! Can i still do without?? WHat would you serve with these as a side? Although I have not tried this recipe without cream cheese, it should still work with just melting cheese. For the creamy factor, try using mascarpone or Neufchatel cheese. For all those asking for nutritional value, if you look up each item that was added, I’m sure you can calculate the calories/fat. 1 cup of broccoli has 25 calories 0 fat and 4 oz cream cheese has 45 calories/4.5 fat. Cheese is the least healthy thing u added and since we all have different likes when it comes to cheese that’s on you. Considering all that I just want to say… Eat what you enjoy and makes you happy, counting nutritional blaza blah for everything I eat kinda takes the happiness out of enjoying it, don’t u think? Just enjoy some things for what they are and love urself for you. Made it for dinner TODAY.It turned out really NICE.Thanks. I’m going to try this for dinner tonight, and I’m going to add shrimp to the mix. The possibilities are endless! Thanks to my daughter, I tried this.. I added mushrooms to the chicken, and marinated the breast the night before.. awesome! Yum! what did you use for marinating? I dont cook often CAUSe I’m afraid I will mess up but I tried making this and it came out exactly how It looks and it TASTEd great, I will make it a weekly maybe biweekly dinner option, I loved it. I used a glass pan instead of the cast iron and it came out fine. Very good dish and easy too. Will definitly make it agAin. Do you have THE BREAK down of nutrition? This recipe looks DELICIOUs and I’d really like to make it soon but I don’t own a cast IRON an oven SAfe PAn. May I ask for an alternative? Any pan that does not have a rubber or plastic handle should be safe. Glass, ceramic, aluminum, cast iron and stainless steel are all oven-safe materials. Low carb and keto are the trend of the moment, right? I love that you put both of them together in just the one recipe! I made this last night for dinner and it was very good. Easy to make, presented beautifully and it makes its own sauce. Healthy and satisfying. Thank you for the recipe.